What is @Mentions? When you type @ in the message body and begin typing a name, an autocomplete list pops up. After you select the name, if the person is not on the conversation, their address is added to the To field. The @mentions in the message body is highlighted for better visibility. At this time it is not possible to disable @Mentions. Pressing Esc will clear the menu after typing the @ sign but you can't prevent the menu from coming up. 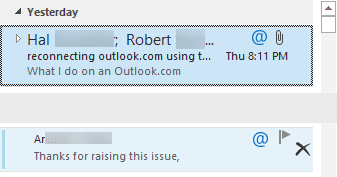 We recommend voting (and commenting) on the issue at Outlook User Voice. The suggestions with the most votes will get attention, so please vote on this suggestion rather than starting a new one: Provide an option to disable @mention feature in Microsoft Outlook 2016. Administrators can vote for an administrator option to disable both likes and @Mention at Allow admins to turn off likes and @mention - PLEASE! Why would you use it? To get someone's attention and point out that you are asking them to do something mentioned in the message. Note: Office 365 and Outlook.com's Focused Inboxes will soon be supported in Outlook. When they are, the Header area of the message list will change. If Focused in enabled, you'll see Focused and Other tabs; if it's not enabled, you'll see Inbox. The Unread and Mention filter is now under the All menu. When a message arrives with a mention in it, the message list will display an @ symbol next to the message and in the thread's group header. When you send an email and type @ in the message, you can select a name to use in the @Mention. If you aren’t typing a mention, keep typing and the autocomplete list will disappear once you run out of matches and enter a space. If the dialog won't go away after displaying the message "We couldn't find the person you were looking for. ", press ESC to dismiss it. When the message is sent, the @mentions are in the message body. Users mentioned will see these messages if they click Mentions at the top of the message list (shown in first screenshot). Clicking the link will open a contact card with the person's contact information. What do the @Mentions look like for non-Office365 emails? Suddenly, I'm seeing this behavior without typing the "@". So if I start typing "Bob Jones". After I type Bob, I get a pop menu - even in the body of a message (so not just in the recipients list). This is very annoying especially, when you want to type a basic greeting like "Bob,". Any idea how to stop this? At this time, it can't be disabled - Esc will clear the menu. But should it happen without typing "@", as described there.